Thousands of avid amateur space explorers have worked together to explore strange new galaxies and to seek out space phenomena called gravitational lenses… all from the comfort of their own homes! Gravitational lenses are rare space phenomena that can aid the study of distant galaxies and help elucidate mysteries such as the age of the universe and dark matter. Space Warps is a project to identify candidate gravitational lenses by employing the help of citizen scientists. The help of citizen scientists has been crucial in identifying potential lenses that have been missed by computer algorithms. An international team of academics has managed to identify a number of potential space phenomena called gravitational lenses. 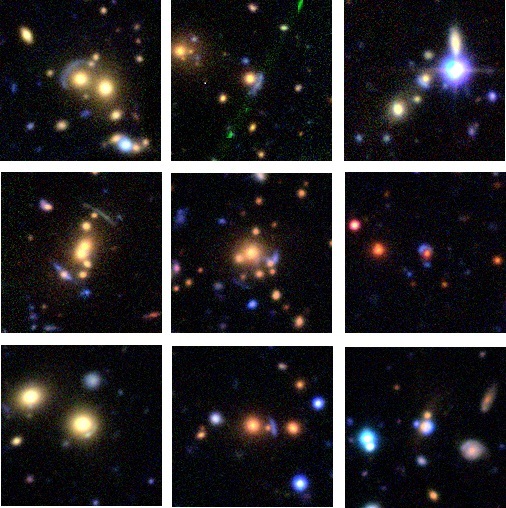 Twenty-nine ‘promising’ gravitational-lens candidates have been identified with the help of 37,000 citizen scientists. The findings were made as a result of the first lens search by Space Warps, a project to use crowd-sourced visual inspections to identify the lenses. The Space Warps project is operated by Zooniverse, which has been responsible for many popular citizen science projects such as Galaxy Zoo. Cases of gravitational lensing are keenly sought after by physicists. The phenomenon is due to Einstein’s general theory of relativity, and the prediction that gravity can bend space, as well as light passing through that space. A particularly massive astronomical object like a galaxy will bend the space around it, and the light from objects behind this galaxy will be distorted as it passes through the galaxy’s gravitational field. This effect can cause the image of objects (such as other galaxies) behind the first galaxy to be magnified (sometimes by a factor of 10) as the light passes through the first galaxy. As an analogy, this effect can be compared to light traveling through a glass lens (such as the ones in a telescope), and being focused onto your eye, albeit by refraction of light rather than gravitational distortion. “Once found, gravitational lenses can be further pursued by astronomers for various scientific investigations,” explains Anupreeta More, a project researcher at the Kavli Institute for the Physics and Mathematics of the Universe (Kavli IPMU) at Tokyo University. Strong lensing is often used to aid the study of distant galaxies and help elucidate mysteries such as the age of the universe and dark matter. However, due to their rarity, finding gravitational lenses is not so simple. To assist in the search, the Space Warps project has enlisted thousands of volunteers who can help out 24/7 by accessing the Space Warps web portal. These citizen scientists — after undergoing training on how to spot gravitational lenses (and avoid false ones) — help examine hundreds of thousands of images from the Canada-France-Hawaii Telescope Legacy Survey (CFHTLS) for possible lenses. The goal of the first Space Warps search was to find and classify the gravitational lenses that were missed by the computational algorithms the CFHTLS uses to identify lenses.